When I’m asked to name my favorite movie, it’s a challenge because there’s no clear answer. My response can change depending on my mood. This isn’t the case with music. There’s only one band that stands as the king of the mountain. That group is Midnight Oil, five guys who are so much more than a protest act. This incredibly talented Australian rock band is unfairly given the dreaded “one hit wonder” label. Peter Garrett, Rob Hirst, Jim Moginie, Martin Rotsey, and Bones Hillman are household names at home but have a smaller but devoted following overseas. They released a long string of great singles during a career that lasted more than 25 years (ending in 2002). Midnight Oil’s most popular tune is 1988’s “Beds are Burning”, but it was hardly their only hit. That classic song made them famous worldwide because of radio play and the popularity of MTV. The powerful image of bald-headed Peter Garrett dancing in the Outback left an impression on viewers who didn’t care about their politics. It pushed Midnight Oil into the spotlight and introduced them to a much broader spectrum of fans. Instead of just participating in rallies at home, they had the chance to speak out around the world. Following the success of their Diesel and Dust album in the late ‘80s, Midnight Oil released Blue Sky Mining and embarked on a successful world tour. During a visit to New York City, they grabbed the opportunity to protest one of the biggest environmental catastrophes of our time. 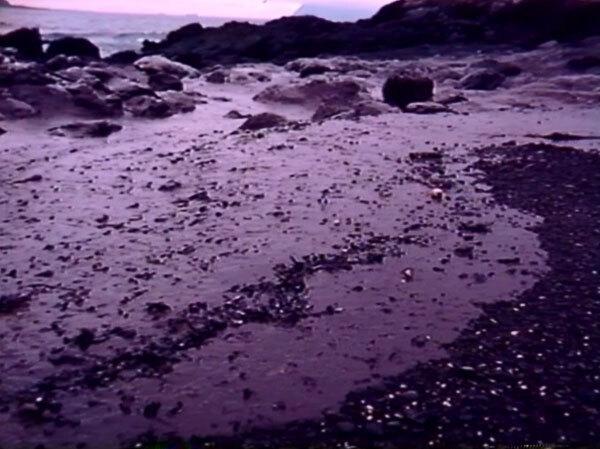 The Exxon Valdez spill happened in March 1989, and the cleanup did not go well. 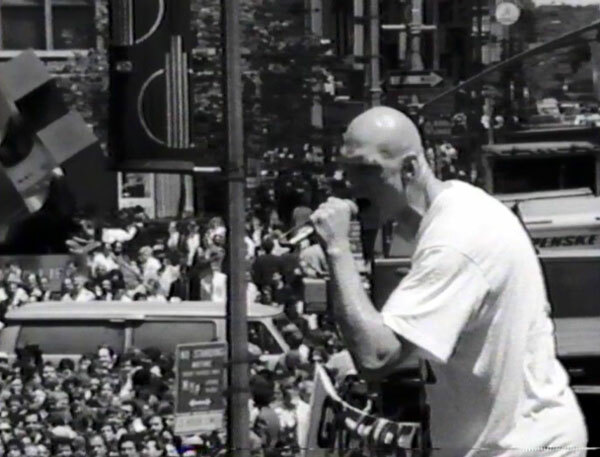 Angry about this disaster and similar issues, Midnight Oil took to the streets and played a concert in front of Exxon’s New York Headquarters. This show took place on May 30, 1990 and was chronicled in the film Black Rain Falls. 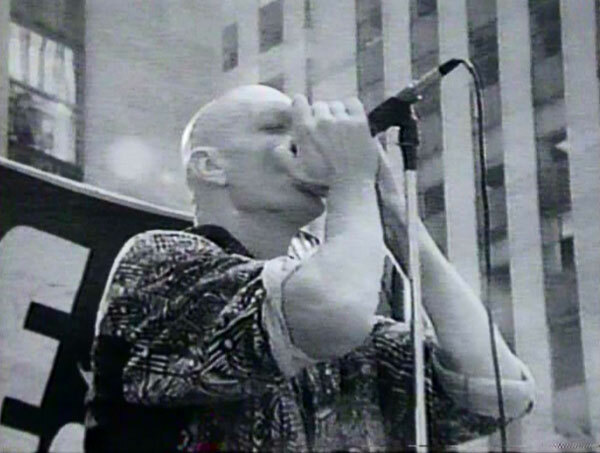 Shot in black and white, the footage shows the power and passion of Midnight Oil’s music. They also deliver a killer set that includes some of their best work. The six-song concert offers a perfect example of why I love Midnight Oil and is worth checking out even if you’re unfamiliar with their music. The set begins with “Dreamworld”, a rocker that takes a bleak view of our future. It’s a signature Midnight Oil anthem that combines sharp hooks with hard-hitting lyrics. The chorus proclaims that “your dream world is just about to end”, and that’s hardly a positive thing. They’re telling us to wake up and realize what’s happening to our natural world. Next up is “Blue Sky Mine”, which provides a biting take on a dire situation for mining workers. Garrett’s harmonica opening is a sharp cry towards the injustice caused by a profit-minded corporate entity. It’s another melodic song, but the resounding question of “who’s gonna save me?” brings a haunting feel. It’s one of Midnight Oil’s best songs and remains poignant several decades after its original release. The surprise inclusion is a rare cover of John Lennon’s “Instant Karma” in the middle of the set. Garrett’s singing doesn’t really compete with the original, but there’s enough power in the chorus to compensate for it. Rotsey and Moginie bring the power on guitar and deliver a memorable performance. The film’s title comes from the lyrics of “River Runs Red”, a somber look at environmental destruction. The slower tune paints a gloomy picture of places we take for granted succumbing to industrial ruin. This leads to the highlight, a raucous version of “Progress” that blows its studio version out of the water. Driven by the phrase “Some say that’s progress, I say that’s cruel”, the song represents the band's mission statement. Technology is moving at a rapid pace, but is it really a good thing? This question is more essential today than it was 23 years ago. The set closes perfectly with “Sometimes”, one of Midnight Oil’s greatest anthems. Garrett takes a tumble while trying to climb up a large speaker, and it perfectly fits with the song's message. “Sometimes you're beaten to the core/Sometimes you're taken to the wall/But you don't give in”. Supported by fast guitars and Hirst’s booming drums, these words deliver an inspiring anthem that injects hope into this experience. It won’t be easy, but perseverance can lead to great things. Black Rain Falls includes the concert along with interviews with the band. It also contains footage of the devastated environment because of the disaster. Even so, there’s a sense that we can save our land if we speak out against this type of wrongdoing. The early ‘90s was still an optimistic time, and that carried into the heyday of the Clinton administration. It seems that even the most idealistic among us has grown resigned to the dire fate of our environment. Despite some minor improvements in recent years, the warning signs remain that we may be irrevocably destroying our planet. President Obama just gave a passionate speech at Georgetown University that pushed for a new focus on the environment, but I wonder if it's too late. Midnight Oil performs in front of a banner stating that “Midnight Oil makes you dance, Exxon makes us sick”. It’s a simple premise and conveys the idea that music can make a difference and change our views. Is that still true today? I’d love to say that’s the case, but it’s probably an overly positive outlook. Midnight Oil supported Blue Sky Mining with an extensive world tour that left them exhausted when they returned home. 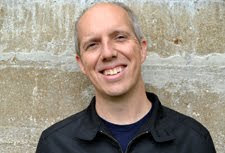 Mark Dodshon’s biography of the band ― Beds are Burning: Midnight Oil, the Journey ― describes the toll that stardom placed on the group. 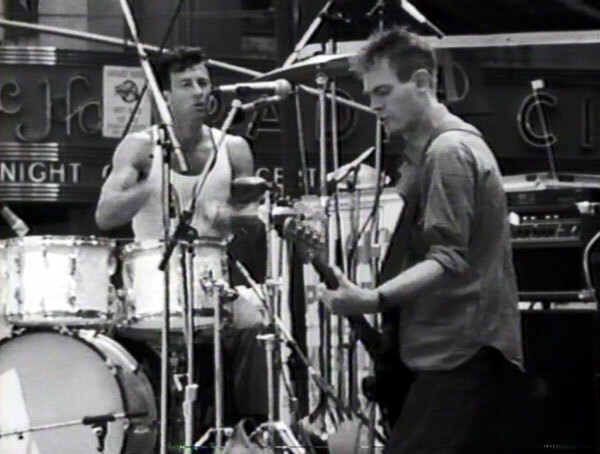 They continued to play together for 12 more years and released another four full-length albums. Even so, they never pushed as hard to obtain stardom. I was thrilled to catch them six times during their last U.S. tour in 2001 and 2002. They played clubs and delivered incredible performances that matched their glory days. They didn’t resemble a band heading for their end. Garrett’s political career ultimately sealed their fate when he won a seat in the Australian government. The remaining members have continued to play together, with the core of Hirst, Rotsey, and Moginie forming the surf group The Break several years ago. They may not have the same recognition of acts like U2 and REM, but Midnight Oil deserves to be in the conversation. The guys never strayed from their beliefs and delivered stirring anthems that have lost none of their power to this day. Great case to a band that is very underrated (well as far as mainstream attention is concerned) as they're a band that is definitely intense and passionate. Something that is lacking in a lot of bands that's on the radio or whatever is the hit on VEVO. Definitely. They could bring it live too. The energy in the albums is about 10% of what they have on stage. In a sense, it's actually not terrible that they didn't blow up huge after their few hits. There's always a chance it could have changed them. They were great right to the end, and I'm still holding out hope for some type of reunion once Garrett leaves political office. I'm glad to hear that you're also a fan. "Black Rain Falls" is fantastic live footage that always brings a big smile to my face and gets me rocking. its a testament to their abilities as as a live band that they did not have time to warm up for this gig, due to an attempt to have it called off by forces in the city government. when news of the pending cancellation came, they were roused from their hotel rooms, rushed to the Exxon building, plugged in and jumped right into "Dreamworld". It's great to hear that you're also a big fan of Midnight Oil and this film. That's an excellent point about the band not having a chance to rehearse and jumping on stage to still do an amazing set. I'm really hoping they'll consider reuniting now that Garrett has announced that he's out of politics. I was lucky enough to work at one of the theatres when they did the Earth and Sun and Moon tour, and also saw them live a couple of times after that. They are one of the best Australian live bands to ever tour. I really hope they do another soon. Definitely! I loved Midnight Oil before seeing them live, but that just made it even stronger. I also first saw them in a theater here during the ESM tour and then caught them six times during their finale tours here in 2001 and 2002. I have a feeling they may play again at some point, though you never know.